Camera360 APK version 7.4.4 has been released. Since many smartphone manufacturers add high quality camera for all of their products, the presence of image processing apps are also increased. They are made to fulfill different needs. In this case, you can consider about Camera360. 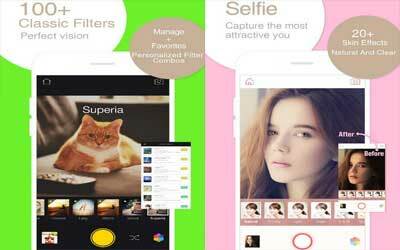 This is an app for image processing both for basic photography and even for selfie. This is an app that has a very great amount of download because it carries so many incredible effects. The predecessor versions are well known for its color character. The newest version is having so many improved features. All these features will surely add greatness for the presence of the awesome image. Basic element that will improve the appearance and the fun elements for your photo is the funny sticker’s availability. The designs of the stickers are pretty impressive. You can even use it with the available face recognition feature. It can follow your face and add the decorative item in the face properly. It is really fun to try. Next, there will also some option for photo collage. With the beautiful collage, this app will offer you high possibilities of an awesome photo collage options. It will attract your follower and friends to like the photo when it is uploaded. Some exquisite filters are also available in order to strengthen the whole performance of your photo. All the filters are working like magic because it can give you more than 100 filters. They are divided as interstellar, magic, star story, HDR and many more. Even for the selfie mode, you will also make a great touch for your whole photo. It is also capable for you to edit the existing photo on the gallery. All the feature and possibilities in Camera360 for android will make the photos that re already stored appear better than never before.